My travel adventure around Southeast Asia kicked off to a great start with my first night spent at the wonderful Akmani Legian in Bali, Indonesia. Centrally located in downtown Legian, a lively upbeat area, walking into The Akmani Legian was a retreat from the hustle and bustle of the busy street. I was warmly greeted at the reception by the friendly staff and offered a welcome drink and refreshing towel. The reception area is elegantly decorated with Balinese artwork and cultural decor. I had my bags taken for me and was shown to my room, whilst taking in the beautiful tropical setting. 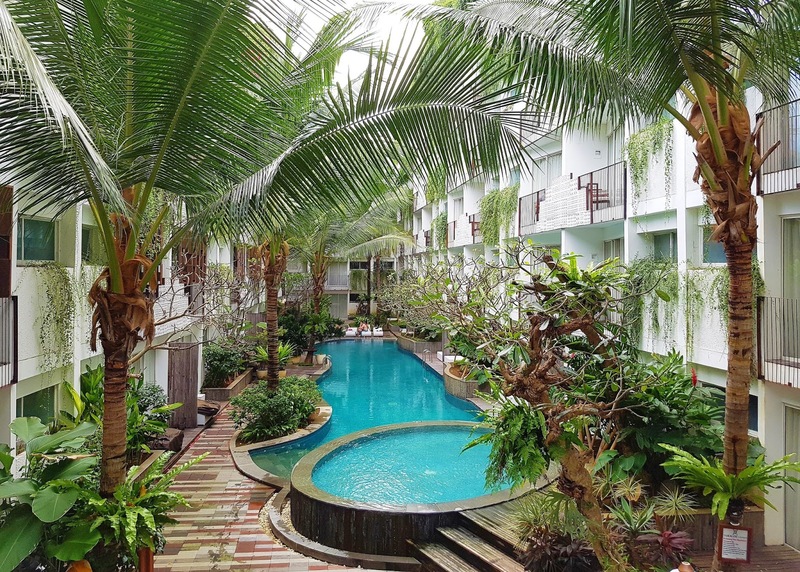 The large downstairs pool is a grand feature with lush greenery surrounding it (see header image!). My deluxe pool access room was located on the ground floor and it was everything I had imagined. Through the door was the enormous Super King bed (which was very comfortable) opposite a desk, seat and TV set on the wall. The room was fitted with air conditioning, good wifi, a fridge, tea and coffee, mineral water and a wardrobe with a safe, robes and slippers. To the left was a spacious wooden style bathroom with every toiletry you could possibly wish for. My favourite feature of the room was the sliding door which leads straight to the pool, it's something I have never had the pleasure of experiencing before and I was very impressed! Your own little balcony comes with a big comfortable lounge seat. 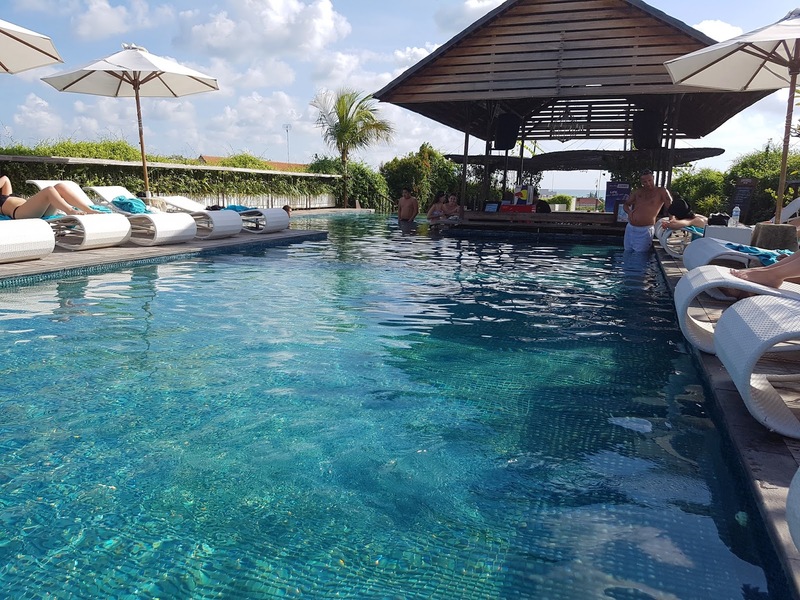 The hotel offers a wide range of facilities including the large swimming pool with a side children's pool and plenty of umbrellas and loungers to relax on. 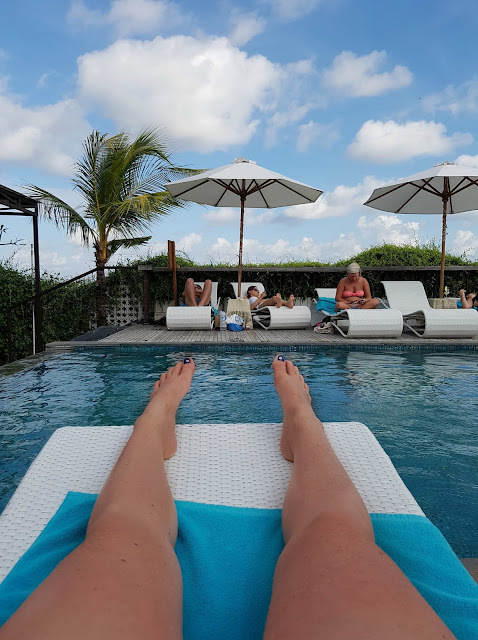 There is a convenient spa, a gym and a rooftop pool bar which has drink specials, a large area with loungers and sofas, lively music and great sunset views. There is also 24-hour reception and room service, tour desk information, airport transfers, meeting rooms, wedding packages as well as a popular roadside restaurant at the base of the hotel which I enjoyed dining at. 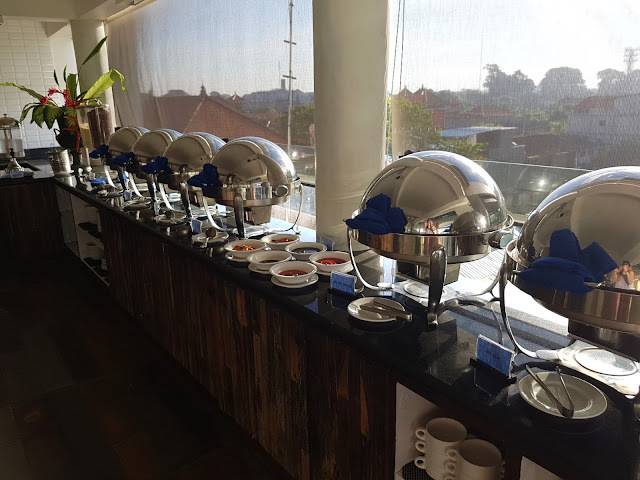 A large daily buffet breakfast is also included in the room. 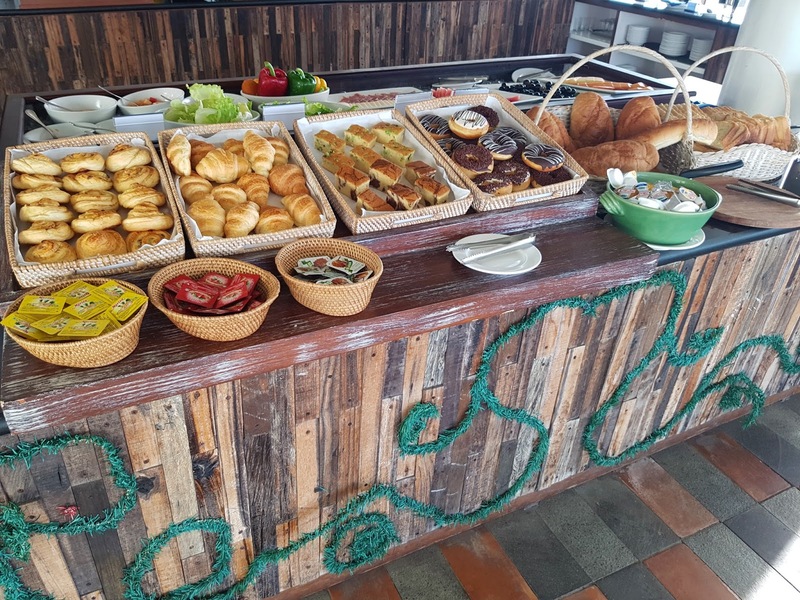 There is a good choice for breakfast, with hot cooked food options, an egg making station, cereals, fresh fruit, pastries, juice, tea and coffee. Set upstairs and outside, it's a very pleasant setting with peaceful music and it's an excellent way to start the day. Reviews: Certificate of Excellence and 4/5 stars from 876 reviews on Trip Advisor. Price: Starts from $50 AUD a night for a Classic Room. My time here was superb. It has everything I would want in a hotel for an enjoyable stay. The staff are fantastic and very helpful. All around the hotel you are warmly greeted with big smiles and a friendly hello. 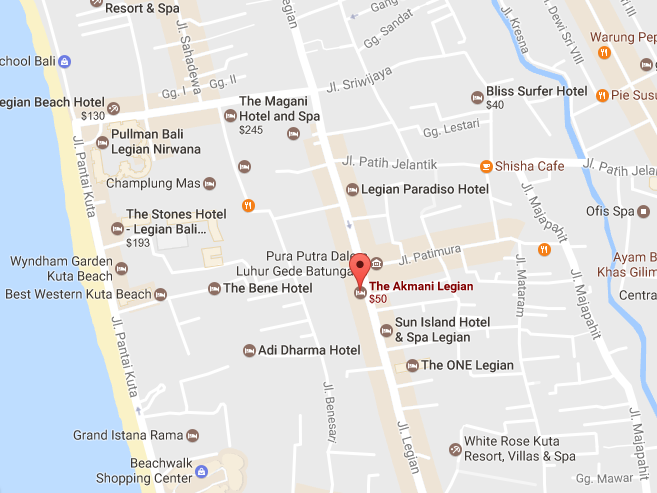 The location is only a five-minute walk to Legian beach or to Ground Zero and the Sky Garden in Kuta if you like to party. There are plenty of convenience stores, shops and good restaurants nearby. It's a very lively area so it really is an oasis amongst its surroundings. 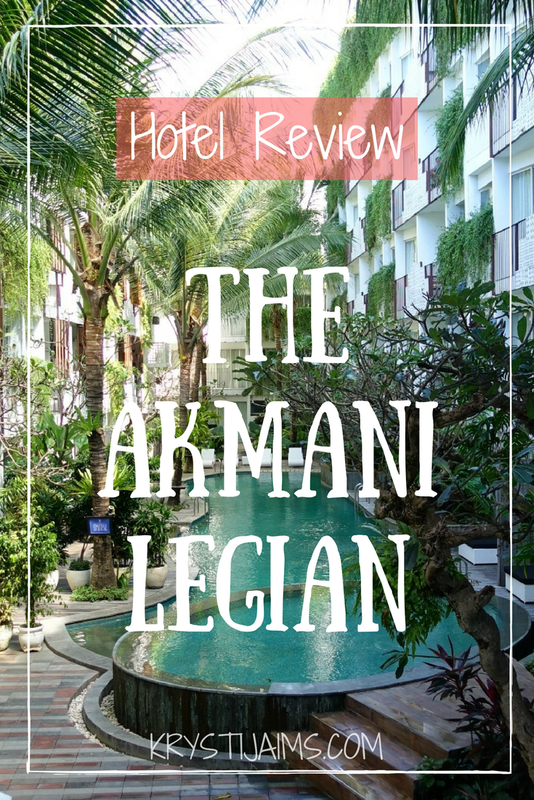 With the comfortable rooms, services and tranquil pool all for a very decent price, The Akmani Legian is an excellent choice for couples, families and groups. I would highly recommend this hotel and can't wait to stay again. Oh my goodness, what a gorgeous place. I would love to stay here soon. This is such a beautiful place. I am looking and reading and wondering where it is. I need to visit Bali. Wow this place looks like a beautiful oasis! A great place to stay! Seems so relaxing! Definitely something I would love to go to!